On Sunday Aug 28 Vance Stevens asked perennial online buddy Jeff Lebow to join him to help check out what is going on with HoA, and what to do about it. We scheduled the event in Hangout on Air but just before show time encountered debilitating sound issues. Fortunately Jeff had been been experimenting with YouTube Live to the point where he had tested out the encoders, and he was able to bring his past experience webcasting-the-hard-way to bear on a solution that saved the show by bringing participants together in a combination of streaming YouTube + Skype for voice conversation. Vance used Camtasia to record the YouTube stream and Skype audio that Jeff was streaming in one part of the screen, with the text chat from http://chatwing.com/vancestev in the other, as you can see on YouTube https://youtu.be/mu7lP0wExl4. In the recordings, enjoy Webheads, Worldbridges, and Learning2gether flying by our signature seat-of-our-pants. When Jeff and Vance encountered the sound problems on HoA prior to the show, we test-connected on Skype to see if the fault lay with Internet bandwidth, or with HoA. We got clear audio, suggesting the problem was with HoA. http://webheadsinaction.org/live and through that interface already in place he was able to stream on YouTube Live (the replacement for HoA after Sept 12, 2016). Those who came to http://webheadsinaction.org/live were able to hear the stream and text chat with us in Chatwing at http://chatwing.com/vancestev. So we were able to bring participants into the Skype call through instructions given in the stream and text chat. My apologies that I was unable to communicate this at our various web sites at the time (not enough fingers nor brain cells) but we did get recordings, mine in Camtasia and Jeff’s Plan C, which at the moment is still posted at http://webheadsinaction.org/live (and when we need that space to announce our next event, what’s there now will be archived). http://chatwing.com/vancestev and chat with us live there. This allowed those who joined us in text chat to learn how they could come to Skype and join our voice conversation, which Jeff had cleverly added to the YouTube Live audio stream. What instigated all of this? Workshop description: The Online Education Initiative promises to bring all California community colleges together into a common LMS, common rubrics and common goals for online teaching. In doing so, however, some important aspects of creativity may be sacrificed, including joyful complexity, pedagogical independence, tolerance in leadership, and alternative visions. Critiquing such a system is the point of this presentation. A Program for Online Teaching workshop with Jim Sullivan and Lisa M Lane. Workshop description: Ideas and thoughts for making your online classes less canned and more interesting for you and your students. What can instructors do to work within and outside of a LMS to create interesting, creative, and interactive online learning environments? 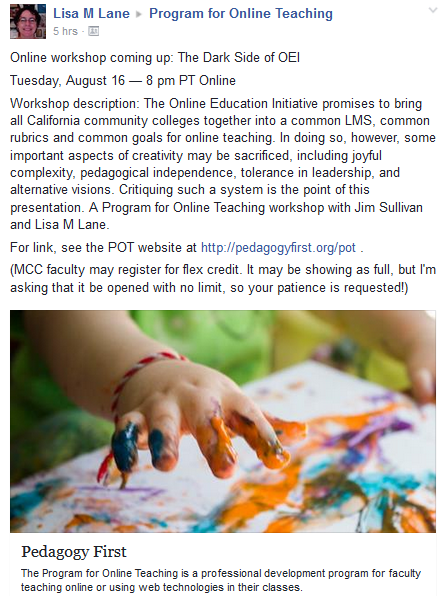 The conversation here will cover grading, student curation of learning, and many other techniques, and will engage with the POT discussion from the Spring of 2016 on creativity in online teaching as a means to expand pedagogy. A Program for Online Teaching workshop with Lisa M. Lane and Joanne Carrubba. Workshop description: Starting Spring 2017, MiraCosta College is adopting Canvas as one of the supported CMSs. For a year and a half, Canvas will run parallel with Bb and Moodle, after which there will only be Canvas. What are some of the potential pedagogical upsides (and downsides) of Canvas, that are worthwhile considering for when you move your course to Canvas? This is not a “how to” workshop – but rather a structured conversation among peers, providing examples and emphasizing dialogue. A Program for Online Teaching workshop with Robert Kelley. On Sunday Aug 14, at the unusually early time of 1230 UTC, but pushing midnight in Canberra, Vance Stevens had a chat with Alexander Hayes, who filled us in on his dissertation journey in a discussion he had enigmatically entitled The Null Hypothesis: On Country, Cyborgs and the Singularity. By the end of his stream of consciousness explanation, all elements in that title were clearly connected. 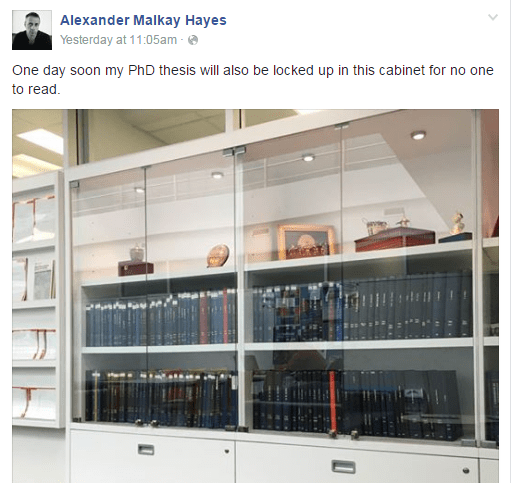 Alexander Hayes is at this writing within six months of completing his dissertation, and before it gets locked away somewhere and forgot about I asked him to spare us an hour and tell us about it. All were invited to join us in the HoA, at the link which was posted in several places at the time. We had two listeners to the live stream. Alexander Hayes has been associated with a number of cutting edge education projects over the years, including exploring the potential of StreamFolio, Talking VTE, POV technologies, Drones for Schools, wearable technologies (and the social implications of surveillance, sousveillance, and uberveillance) and most recently, Google Glass through posting his interviews with 60 Google Glass Explorers on YouTube, https://www.youtube.com/playlist?list=PLfhVHi9gqg5TLDTvvpVbI89NI5EJirTw8, and hosting the recent Glass Meetup #1 in Canberra. More recently I was honored to be interviewed as a small part of the data set in his extensive research, and I’m looking forward now to hearing about how all of that data have coalesced into a thesis soon to be locked away in a cabinet for no one to read 🙂 and what it all has to do with ‘on country’, cyborgs, and singularity. All are welcome to join us and learn more about Alex and his always provocative ideas and innovations. 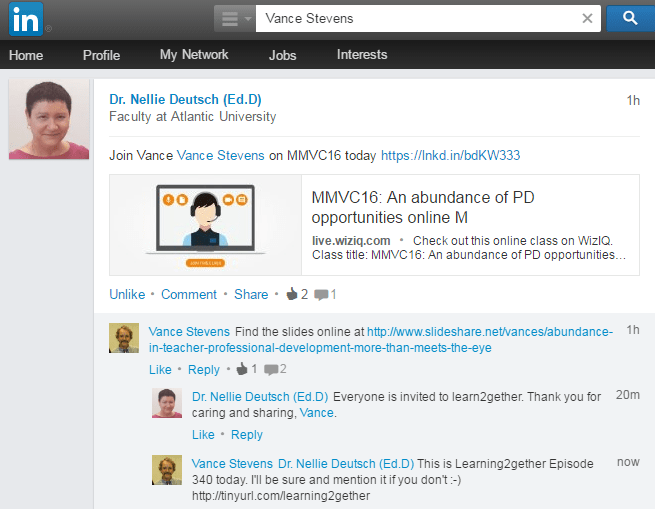 An abundance of PD opportunities online: More than meets the eye. This Learning2gether Episode #340 is one of many online PD opportunities that are taking place literally as we speak, and if this is a representative moment, this extrapolates to an abundance of PD opportunities online at any given moment. Abundance in teacher professional development implies TPD that is free, easily accessible, and available as per user interest in the manner of a berry bush, where users pick the most desirable berries from among those most easily reachable. But institutional PD is often approached from a mindset of scarcity, meaning it is time-bound, tied to brick and mortar, and often driven top-down. This presentation will help viewers visualize the abundance in a way that this perspective can be shared with whomever is driving your PD through a scarcity paradigm. Hyperdocs: Digital Lesson Design Using Google AppsWe are so excited to welcome Lisa Highfill, Kelly Hilton, and Sarah Landis to our kick-off webinar for the new school year! They will be sharing a fantastic digital tool which they created called “HyperDocs.” You will be thrilled to learn all of the powerful uses for HyperDocs to facilitate and enhance learning for your students!Webinar Description: In this webinar, participants will learn how to improve their digital pedagogy instantly by creating HyperDocs – powerful inquiry-based learning tools. HyperDocs are digital tools that replace the worksheet method of delivering instruction. Lisa Highfill, Kelly Hilton, and Sarah Landis will discuss how using Google apps for packaging and workflow can greatly enhance reading and writing instruction. We will explore the philosophy behind HyperDocs, how to create them, and they will present many examples that you can edit, revise, and use in the classroom. Additionally, participants will learn how creative packaging of digital web tools can be used to transform their lessons into interactive, multi-layered experiences for students. This workshop is great for all grade levels and subjects including administrators and coaches, and each participant will leave the session with new thinking about how to effectively integrate digital instruction.Remember to follow us on Twitter: #liveclass20More information and session details are at http://live.classroom20.com. If you’re new to the Classroom 2.0 LIVE! show you might want to spend a few minutes viewing the screencast on the homepage to learn how we use Blackboard Collaborate, and navigate the site. Each show begins at 12pm Eastern (GMT-5) and may be accessed in Blackboard Collaborate directly using the following Classroom 2.0 LIVE! link at http://tinyurl.com/cr20live. All webinars are closed captioned. On the Classroom 2.0 LIVE! site (http://live.classroom20.com) you’ll find the recordings and Livebinder from our recent “ Open Mic show “What’s on your Summer Bucket List?”” session facilitated by the always amazing facilitator extraordinaire, Paula Naugle Click on the Archives and Resources tab.